The girls are off and running in the 100-meter hurdles. The lead group of the boys' 1,600 meter race turns the corner at the track in Ronan. 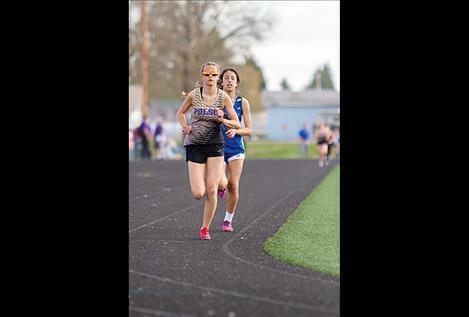 Polson Lady Pirate Molly Sitter and Mission Lady Bulldog Karolyna Buck battle it out during the 1600. 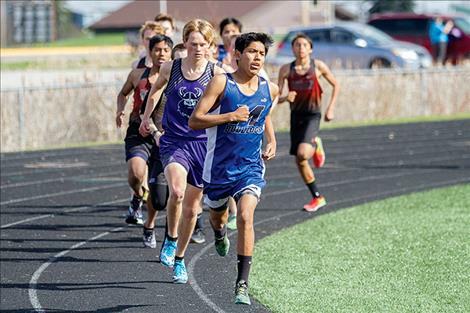 RONAN - The Polson High School boys and girls track teams each took first place out of six Mission Valley area schools competing at the Lake County track meet, Thursday at Ronan High School. The Polson girls brought home seven first place finishes, racking up 160 total points to finish slightly ahead of Charlo with 155 points. On the boys’ side, Polson had 178 points - distancing themselves from host school Ronan with 131 points. Nathan Davis posted a 54.83 time for the win in the boys 400-meter, James Normandeau won the 800-meter (2:02.6) and Zack Gainan won the high jump (5-6) for the host school Ronan. Bea Frissell and Kyla Blixt both won two events to lead the Polson girls. Frissell won the girls’ 800 in 2:25.92 and 1,600 in 5:33.48, while Blixt won the shot put (30-4) and discus (90-11). 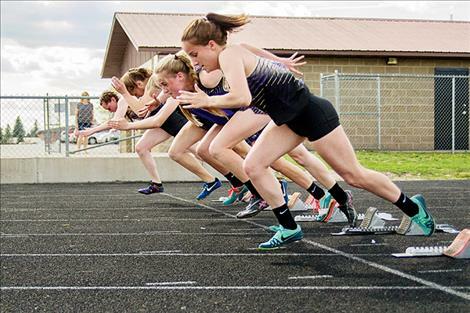 Other Lady Pirates earning top finishes were Naima Crowl in the 3200 (12:43.39), Shayla Olson in the 300 hurdles (49.75) and Mikaela Ducharme in the triple jump (33-4 ½). For the Polson boys, Trenton Adler won both the 100-meter (11.54) and 200-meter (23.49); Colton Cote dominated the hurdles winning both the 110 (15.67) and 300 (41.24), while Colby Soderquist placed first in the pole vault (12-6). The Charlo Viking squad had three double event winners. Wills DeGrandpre won the boys’ 1,600 (4:49.03) and 3,200 (10:37.97). For the Charlo girls, Tyrah Hammond placed first in both the 100-meter (13.3) and 400-meter (1:02.52), while Carlee Fryberger ran away with the 100 hurdles (16.49) and 200-meter (27.01). Michael Durglo led the way for the Mission Bulldogs, winning the boys’ javelin with a throw of 134 feet, 8 inches; shot put with a launch of 47 feet, 2 inches and discus with a toss of 129 feet, 1 inch. Teammate Flint McPherson scored first place finishes in both long jump (18-3 ½) and triple jump (38-6 ½). For the Mission girls, Karolyna Buck won the high jump at five feet even, Leila Marsh placed first in javelin (92-6) and Sydney Brander placed first in the long jump with a jump of 16 feet. Shawntaya Nelson’s vault of 7 feet, 6 inches propelled her to Arlee’s lone first place finisher. 100 — 1. Trenton Adler, P, 11.54; 2. Kyle Druyvestein, P, 12.01; 3. Landers Smith, C, 12.23. 200 — 1. Trenton Adler, P, 23.49; 2. Kyle Druyvestein, P, 24.04; 3. Landers Smith, C, 24.19. 400 — 1. Nathan Davis, R, 54.83; 2. James Normandeau, R, 55.22; 3. Alex Wall-Wilbert, P, 55.70. 800 — 1. James Normandeau, R, 2:02.6; 2. Quin Stewart, P, 2:04.09; 3. Kiry Detwiler, R, 2:15.59. 1,600 — 1. Wills Degrandpre, C, 4:49.03; 2. Quin Stewart, P, 4:52.94; 3. Isaiah Nasateweya, M 5:03.65. 3,200 — 1. Wills Degrandpre, C, 10:37.97; 2. Landon Shipley, P, 10:40.56; 3. Mason Sloan, P, 10:56.25. 110 hurdles — 1. Colton Cote, P, 15.67; 2. Brennan Roullier, R, 16.93; 3. Toby Odom, C, 17.73. 300 hurdles — 1. Colton Cote, P, 41.24; 2. Toby Odom, C, 43.62; 3. Brennan Roullier, R, 44.92. 4x100 relay — 1. Polson, 45.06; 2. Charlo, 46.8; 3. Ronan, 48.01. 4x400 relay — 1. Charlo, 3:42.05; 2. Ronan, 3:42.31; 3. Polson, 3:45.6. Shot put — 1. Michael Durglo, M, 47-2; 2. Landon Lynch, R, 43-2; 3. Samuel Mocabee, R, 33-8. Discus — 1. Michael Durglo, M, 129-1; 2. Landon Lynch, R, 106-4; 3. Zane Benson, P, 98-6 ½.
Javelin — 1. Michael Durglo, M, 134-8; 2. Brock Tomlin, C, 128-5; 3. Darius Redstar, M, 126-7. High jump — 1. Zack Gainan, R, 5-6; 2. Darian Liberty, C, 5-4; 3. Asa Askan, P, 5-4. Pole vault — 1. Colby Soderquist, P, 12-6; 2. Jarod Farrier, P, 12-0; 3. Landers Smith, C, 11-6. Long jump — 1. Flint McPherson, M, 18-3 ½; 2. Zack Gainan, R, 18-2 ½; 3. Darius Redstar, M, 18-1 ½. Triple jump — 1. Flint McPherson, M, 38-6 ½; 2. Darian Liberty, C, 38-1 ½; 3. Zarec Couture, R, 36-4 ½. 100 — 1. Tyrah Hammond, C, 13.3; 2. Carlee Fryberger, C, 13.42; 3. Kinsely Barney, R, 13.56. 200 — 1. Carlee Fryberger, C, 27.01; 2. Tyrah Hammond, C, 27.6; 3. Kinsely Barney, R, 27.9. 400 — 1. Tyrah Hammond, C, 1:02.52; 2. Lindsey Brooks, R, 1:05.67; 3. JaNessa Taylor, P, 1:05.86. 800 — 1. Bea Frissell, P, 2:25.92; 2. Molly Sitter, P, 2:33.61; 3. Lindsey Brooks, R, 2:40.01. 1,600 — 1. Bea Frissell, P, 5:33.48; 2. Molly Sitter, P, 5:52.1; 3. Karolyna Buck, M, 6:07.29. 3,200 — 1. Naima Crowl, P, 12:43.39; 2. Gwen Seeley, P, 13:04.66; 3. Shawntaya Nelson, A, 14:12.00. 100 hurdles — 1. Carlee Fryberger, C, 16.49; 2. Shayla Olson, P, 17.2; 3. Kaitlin Cox, C, 17.33. 300 hurdles — 1. Shayla Olson, P, 49.75; 2. Allie Delaney, C, 55.94; 3. Addy Day, P, 58.18. 4x400 relay — 1. St. Ignatius, 55.87; 2. Charlo, 4:33.06; 3. Mission, 4:56.59. Shot put — 1. Kyla Blixt, P, 30-4; 2. Tristen Adams, M, 29-7; 3. Allie Delaney, C, 28-1. Discus — 1. Kyla Blixt, P, 90-11; 2. Liev Smith, C, 85-8; 3. Nancy Kenmile, R, 79-6 ½.
Javelin — 1. Leila Marsh, M, 92-6; 2. Liev Smith, C, 88-3; 3. Hunter Eichert, M, 88-0. High jump — 1. Karolyna Buck, M, 5-0; 2. Afton Brander, M, 4-8; 3. Lindsey Brooks, R, 4-6. Pole vault — 1. Shawntaya Nelson, A, 7-6; 2. Tyrah Hammond, C, 7-0; 3. Destiny Manuel, C, 7-0. Long jump — 1. Sydney Brander, M, 16-0; 2. Kaitlin Cox, C, 15-6 ¾; 3. Afton Brander, M, 15-6 ½. Triple jump — 1. Mikaela Ducharme, P, 33-4 ½; 2. Kaitlin Cox, C, 33-4 ¼; 3. Carlee Fryberger, C, 32-10.